My cousin brought this towel for me (when she was in Ireland), because it had a seven on it (my lucky number). She couldn’t find one with a black sheep but I do have a mug (somewhere) with a black sheep. I don’t think sheep should have numbers on them. 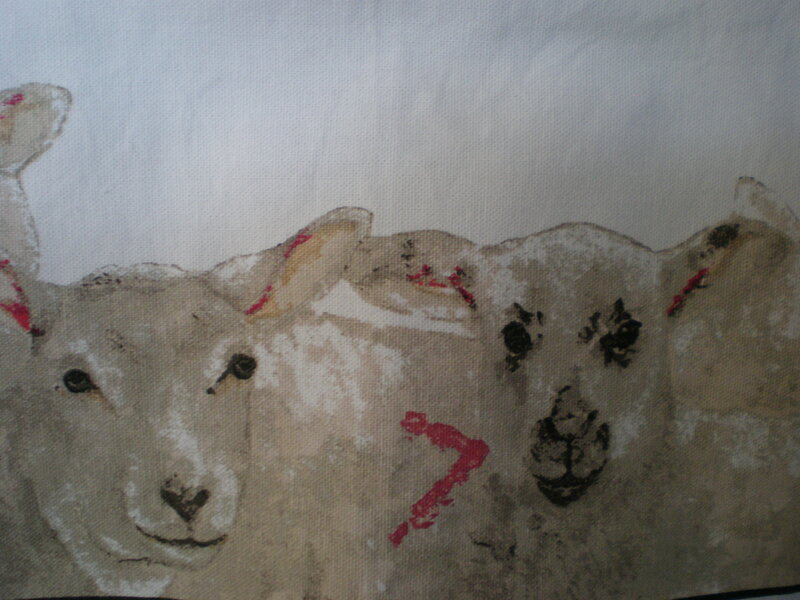 Sheep should be loved and unnumbered. Numbering beings is not a good thing, unless people are in a race or they are kindergarden kids on a school trip and the teachers are afraid they might lose one of them. Other than that there is no excuse. Sheep are beautiful beings and lambs are sweet and adorable. They are not food but living beings who feel pain and terror. They feel fear. They feel love for each other. They are only food because people told others that they were food. If you had been taught different story, if you grew up believing that sheep were not food, you would be horrified and shocked by the fact that people kill and eat these beautiful beings. People who eat meat were taught that it’s okay to do so. Their habits cause untold suffering and death, but they weren’t taught that part of it. It’s like that with everything we believe. We were only told part of the story. We need to rethink the things we do. This entry was posted in Animals/Birds, Philosophy of life and other good stuff, Politics/Herstory, Thoughts, vegetarianism. Bookmark the permalink. Definitely. We take the things we believe for granted. They aren’t things we even think about. We go through life with the ideas of others, in our heads and our lives. We need to think for ourselves. i have numbered myself with seven (actually my birthday date did it) 😉 but i would never ever do it to someone else! We have found ourselves in a world that confines and tortures and kills and eats living feeling creatures, wears their skin and fur and wonders of the absence of peace in the world, puzzles on their lack of happiness. Beautifully said. People have been TAUGHT that it’s okay to do those things. They hand down the cruelty from generation to generation but they forget to pass on what happens to the animals because of their conditioning and habits. Parents don’t tell their kids that they are eating flesh and blood. That a beautiful animal suffered, was tortured, terrified and killed so that they could have dinner. It doesn’t HAVE to be this way. It’s TAUGHT to be this way. We will never have peace. We are not peaceful beings.